NextGen Cryotherapy San Diego’s Whole Body Cryotherapy (WBC) is a cutting-edge innovation using hyper-cool temperatures to stimulate powerful physiological responses and trigger the body’s natural healing processes in a therapeutic manner. These remedies include accelerating healing in soft tissue and joints, reducing inflammation and pain, and boosting your metabolism inside our cryo chamber which immediately lowers your body’s temperature (without freezing it) through the application of instant cold therapy using nitrogen gas. Cryotherapy offers fitness, wellness and beauty benefits to individuals striving to improve their overall well-being by feeling, looking and performing better everyday. Explore the science and process behind cryotherapy cold therapy today. ‘Awesome!’ is often a response that we hear from our Cryo clients as they exit the cooling chamber. Just tried cryotherapy for the first time. The staff (Mark and Matt) took time to explain the process and made the experience great! Highly recommend this place and will definitely go back. Thanks guys! I did the cryotherapy after my marathon immediately felt relief. Everyone at their facility is super friendly, talkative, and seems to genuinely care about everyone. Love this place. Amazing is the only word to describe this place. Great location, Great Staff, Great, Staff, Super Friendly. 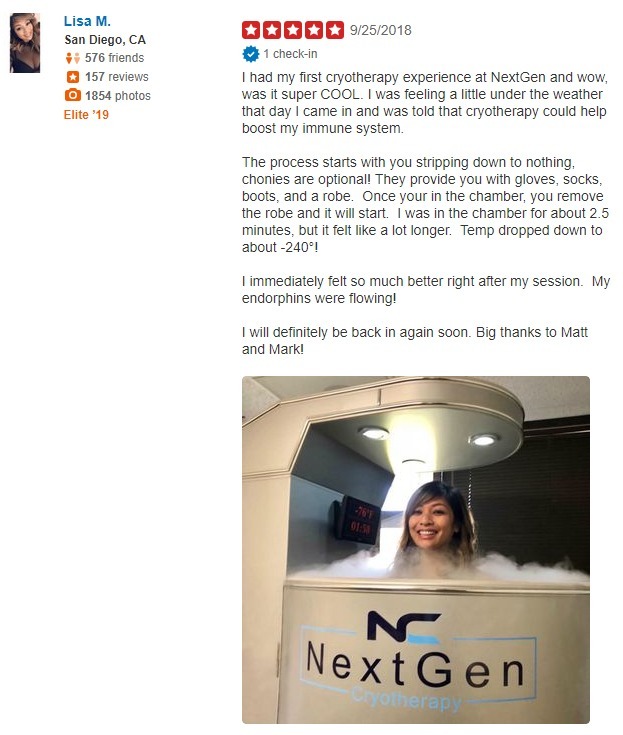 If you're looking to learn more about whole body therapy go to NextGen Cryo. I have done cryotherapy before and was happy to find out that they opened down the street my body really needs it! The staff are very friendly and make the process smooth sailing. Great place to get your freeze on. I suffer from rheumatoid arthritis and am in pain every morning. My chiropractor recommended NextGen Cryo and can't explain how much better life is now that I have incorporated cryotherapy sessions. The staff is very knowledgeable and made my first cryo experience amazing! I'm definitely doing this every day until I stop playing ball! The cryo session itself was a breeze! Mark explained how everything worked and the benefits...then we did the freeze. It was quick, painless, and I was comfortable the entire time. I walked out feeling better than when I walked in! Can't wait to see how cryotherapy will help my recovery feel over the next few days. After the 2 minutes fly by you're out and feeling great. My aches went away and I started to break a light sweat getting dressed. They say your body will burn 600 calories and I didn't believe it until I got a burst of energy about 30 minutes after. It lasted a good portion of the day. I had my first cryotherapy experience at NextGen and wow, was it super COOL. I was feeling a little under the weather that day I came in and was told that cryotherapy could help boost my immune system. I immediately felt so much better right after my session. My endorphins were flowing! I suffer from fibromyalgia and was very hesitant to try out cryotherapy but Mark and Matt were incredibly informative and talked me through my 3 minute process. I have never felt so good in such a short period of time and best of all I don't have to take pain meds! My favorite thing to do right before the gym, thanks guys! Disclaimer: Please consult your physician prior to considering cryotherapy. The approach is safe, however, NextGen Cryo is not liable for unforeseen circumstances. Pregnant women, those with hypothyroidism, extreme hypertension, cardiovascular disease, bleeding disorders, uncontrolled seizures or respiratory issues should not use cryotherapy. Cryotherapy does not take the place of any professional medical care or treatment.